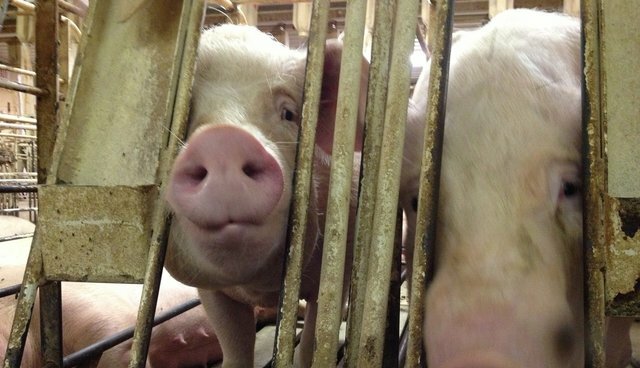 An incredibly important investigative essay in The New York Times by Michael Moss called "US Research Lab Lets Livestock Suffer in Quest for Profit" shows clearly and in most disturbing detail that "food animals" - including cows, lambs, and pigs - at Nebraska's tax-payer financed US Meat Animal Research Center are brutally harmed and killed - some left to die on their own or killed by predators - in their reprehensible quest for profit. If you're a doubter and think this is some "radical hype," Mr. Moss's outstanding essay will show you that research on "food animals," and eating factory farmed animals whose well-being is thoroughly ignored to make them bigger and to have them make more babies, should be stopped right now. I read a lot about animal abuse, but this essay made me ill, and I just want to highlight some of its contents and let you decide how much you want to read and can tolerate. A number of people told me they couldn't make it to the end of the essay absent tears. Pigs are having many more piglets - up to 14, instead of the usual eight - but hundreds of those newborns, too frail or crowded to move, are being crushed each year when their mothers roll over. Cows, which normally bear one calf at a time, have been retooled to have twins and triplets, which often emerge weakened or deformed, dying in such numbers that even meat producers have been repulsed. Last Mother's Day, at the height of the birthing season, two veterinarians struggled to sort through the weekend's toll: 25 rag-doll bodies. Five, abandoned by overtaxed mothers, had empty stomachs. Six had signs of pneumonia. Five had been savaged by coyotes. "They pay tons of attention to increasing animal production, and just a pebble-sized concern to animal welfare," said James Keen, a scientist and veterinarian who worked at the center for 24 years. "And it probably looks fine to them because they're not thinking about it, and they're not being held accountable. But most Americans and even livestock producers would be hard pressed to support some of the things that the center has done." "Experimental surgery is being performed in some (not all) cases by untrained, unskilled and unsupervised staff," Mr. Downey wrote. "This has resulted in the suffering of animals and in some cases the subsequent death of animals." Roger Ellis, a scientist and veterinarian who now works for a cattle nutrition company, said that when he determined about 10 years ago that a sheep had died at least in part from neglect, a center official pressed him to "soften the diagnosis." Dr. Ellis said that he refused, and that the center had an outside veterinarian change the death record. Last February, Katherine Whitman, a University of Nebraska veterinarian who works at the center, proposed an experiment to find more effective pain medicine for two common procedures on sheep: tail removal and castration. ... The center said it lacked the expertise to assess the pain felt by animals when they turned down the proposal. Please note that many of the center's critics worked there as researchers and technicians and were very concerned and sickened for what was happening to the animals "in the name of science." Mr. Moss's essay is one of the most important of its type and I hope it receives wide readership. It is not "radical hype." In addition, the brutal and heartless treatment of these highly sentient beings ignores what we know about their rich and deep emotional lives (see also). The same can be said about how what we know about "lab animals" from detailed scientific research is blatantly ignored in current laws and legislation that are supposed to protect them. Please voice your opinion. You can contact the meat lab here and its director, Emil Pollak, by email at e.john.pollak@ars.usda.gov or by phone at (402) 762-4109.